There’s enough for everyone to share in a small, bustling garden of edible plants inhabited by crows and creepy-crawly snails, worms, caterpillars, butterflies, and ants—all smiling and inviting young readers to join them. A crow perches on a scarecrow’s arm and calls to the other crows, who happily feast on some tomato seeds. As a man waters a newly planted row, a rabbit observes and a kitty makes space for a cavorting puppy—and multiethnic children help and watch as the veggies grow up, down, and around. And on the final pages, everyone—yes, everyone—enjoys a feast prepared from their bounty. 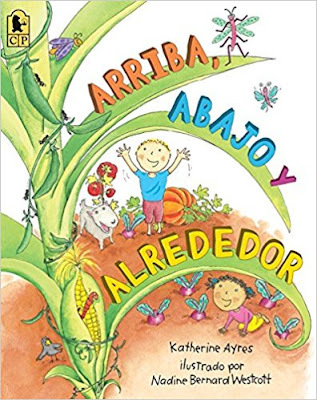 Young readers and listeners will be entranced as they observe the processes of planting, watering, and harvesting veggies. Westcott’s cartoonish ink and watercolor illustrations—on an eye-catching, bright palette of earthy colors with lots of white space—complement Ayers’ spare text. 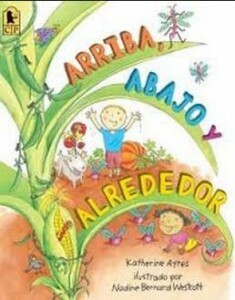 As well, each Spanish and English set—“El maíz crece hacia arriba. Las zanahorias crecen hacia abajo. Y alrededor, los pepinos trepan, trepan y trepan.” // “Corn grows up. Carrots grow down. Cucumbers climb around and around”—has its own playful rhythm and an economy of words that echo the action. It's unfortunate that the translator is not named. Arriba, Abajo y Alrededor // Up, Down, and Around are perfect for bilingual preschool classrooms—especially those with an “empty” space (even a very small one) in which to plant, care for and harvest seasonal veggies. They’re both highly recommended. The school bell sounds…and the classrooms explode with the noise of books closing, chairs sliding on the floor, and kids chattering. It’s time for recess! The students head outside to the school garden. For children who have “graduated” from Arriba, Abajo y Alrededor // Up, Down, and Around—and for educators to dream about—comes the creation of multi-talented photographer and documentarian George Ancona, who takes readers on a year-long visit to the Acequia Madre Elementary School in New Mexico, where he watched and photographed young students working side by side with their parents, teachers and friends—including volunteer college students—on all aspects of their large community garden behind the school. In early spring, the youngsters cut out pictures from seed catalogs and, with guidance, decide which flowers, fruits and vegetables they would like to grow. Starting with building and maintaining compost piles from food scraps, to planting seeds in the greenhouse and later transplanting them into the garden beds, to watering, to raising butterflies from cocoons, to worms, bees and garter snakes, to making adobe bricks and constructing waffle beds, to writing their thoughts and experiences and creating leaf prints to decorate the greenhouse and the outdoor classroom—the children have so much to learn and do. As their school garden flourishes, it also becomes a shared experience and a gathering place for the whole school community. Ancona’s gorgeous full-color photographs are laid out with lots of white space to accommodate his clear, accessible text and student art rendered in marker or crayon. To celebrate the end of the harvest, there are lunches prepared with the garden’s vegetables, and they “become festivals of good food and fun.” And on the last community day of the year, students and families come together again to prepare the garden for its winter rest: “All is ready to be covered with a blanket of snow. Sleep tight, garden! 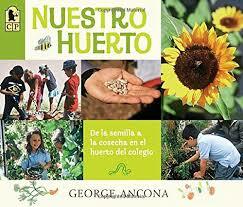 Until next year!” Nuestro Huerto: De la semilla a la cosecha en el huerto del colegio // It’s Our Garden: From Seeds to Harvest in a school garden are both highly recommended.